TomorrowWorld (TW) brings together lovers of music from around the globe. The intense weekend of energy, thrill, excitement, and passion bring a diverse group of people passionate about life, music, and love together in one location. We heard recently from Vincenzo, who traveled all the way from South Africa to be at TW, and there were countless others who traveled for the spirit, culture, and music of TW. What is amazing about TW is that the combination of music, art, creativity, fun, and environment, create a culture of openness and acceptance that pervades even into the online world surrounding TW. Wandering through Dreamville, you’ll find Israelis chatting with Americans, Italians helping some Australian girls put paint on, and Brazilians chilling with South Africans. People from all over the globe flock to TW for the good vibes and good music. Many people made some festie besties that weekend, exchanging numbers and Facebook info. And then there was Estefania Velazquez and Phillip Hassell. Estefania made the trek to Georgia from Toluca, Mexico (about 1,300 miles!) and Phillip came from Tulsa, OK. The two met at the festival and have been together ever since, despite being from different countries. You both met at TomorrowWorld. How did you guys meet? Phillip: We both set up camp in the red district, camping about 20 ft from each other. She came with 3 of her friends from Toluca. I was traveling alone, only knowing a hand full of people that I had only talked to through the TW Solo group page. After setting up our camps, she walked over to my campsite and began introducing herself to our group. I remember hearing a latina accent (which I love) and turning to see a gorgeous little girl in a minnie mouse shirt. I noticed that when we initially met she was looking at my eyes and later told me how much she loved them. Her friends grabbed her on their way to the gathering and we didnt see each other again until after it was over. When we were back at the tents, after all our friends had gone to sleep, I saw her and yelled “MINNIE MO– USE!”, she responded with the first “MI AMOR!” of our relationship, before walking over to me. I invited her to sit with me and we spent the remainder of the night talking about life, what a magical place Tomorrowworld was, and how amazing it was to be a part of this experience with so many different people from all over the world. That was the first time we kissed, and we both fell asleep, with her on my lap, as we watched the sun rise over Dreamville. At what point during the festival did you realize that this wasn’t just a short fling that would end after the festival? Phillip: Throughout the weekend we spent every night in Dreamville together (referring to each other as boyfriend and girlfriend for the weekend), walking around, enjoying lightshows, meeting new people, and taking in all that TW had to offer, but only saw each other inside the festival on Sunday. During the course of that day we ran into each other twice. The first time was outside of the OWSLA stage and the second was at Main stage a few hours later. After meeting up a second time we both decided not to ignore this twist of fate and stayed together the rest of the night, seeing Sander van doorn, Nicky Romero, Hardwell, David Guetta and Armin van Buuren together. I knew this girl was different, but Sunday is when I realized that I felt something more for her. Leaving Tomorroworld was hard for both of us, not purely because we would be leaving the awesomeness that is Dreamville, but we didnt know if we would ever see each other again. What was it about the festival that drew you both to the festival and drew you together? Phillip: This was only my 2nd festival (1st being Wakarusa ’13) and it was her 1st. We both enjoy EDM and had seen the aftermovies from Tomorrowland over and over and we wanted to be a part of those massive crowds and experience the magic that had given us goosebumps so many times. Tomorrowworld was a place of acceptance, freedom, unity, peace and love. Everyone there was welcoming, kind and in good spirits. It was the perfect environment for being open too, and experiencing new things. You both live very far apart. How did you decide that, despite the distance, it was important (and possible) to have a relationship? Phillip: After spending so much time talking and getting to know each other, the distance really wasn’t a factor for either of us. We just knew how we felt about each other and that if we worked hard enough we could make anything happen. What is it that TomorrowWorld means to you both? Do you think you would meet there again? Why? Phillip: Tomorrowworld means everything. It gives a glimpse into a world that focuses on living in the now, following your dreams, being happy, and there are few things in life that are more important. It shows what things could be like if everyone were accepting and positive. It is hope that our generation can make a big difference in this world. We are planning on being together when the 2014 tickets go on sale and will be going this year to celebrate our 1 year anniversary. Art, music, technology, beauty, love… these are all facets of TomorrowWorld and in many ways define our generation. Even the fact that you can still be as connected as you are in your relationship despite the distance is a signature of our era. How do you think these factors are reflected in or heighten your relationship? Phillip: We are very fortunate to have such great means of communication available. Being able to see each other every night and share in everyday moments, which even a decade ago would be near impossible, has made things much easier . This is our modern day fairytale. Full of frozen skype screens, whatsapp messages and snapchats, its up to us to do what we can with what we have and focus on learning from each other and growing together. Do you think much of your future together? If so, can you tell us about it? Phillip: The plan is to move in together at some point. The time frame and location are still undecided but we both understand that his is a big step and that we need to really be prepared. 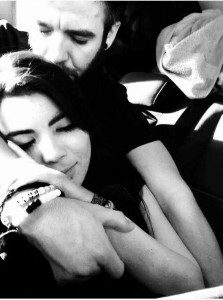 It’ll take lots of work and wont be easy, but I couldnt think of a better person to accompany me on this adventure. Have you guys have the opportunity to meet up in person since TW? 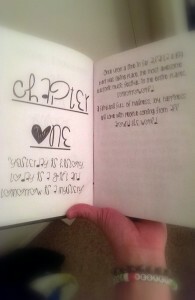 Phillip: As if Tomorrowworld wasn’t cool enough story, Estefania gave me the best Christmas/New Years I’ve had so far. This girl that had only known me at the time for 3 months, flew 1,300 miles to Tulsa on December 24th. She met my family and all my friends. On Christmas I took her ice skating and we got to take a carriage ride through town. The next day we drove to Dallas and went to Lights All Night with friends we had met from Tomorrowworld. Our newly formed Tomorrowworld reunion then headed to Austin for New Years. 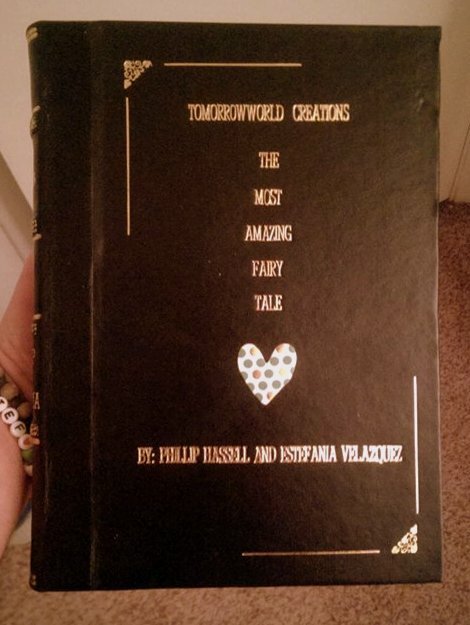 One of her gifts to me was a book titled, “Tomorrowworld Creations: The Most Amazing Fairytale,” where she tells the story of how we met. Tomorrowworld not only brought the World together, but brought me and the most amazing woman I have ever met peace, love, and happiness. TomorrowWorld brings together fans from around the globe, coming together to share in an amazing experience. 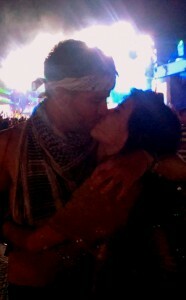 The energy that brought Phillip and Estefania to TomorrowWorld has also held them together. Thanks to technology, the same technology that allows electronic music to even exist and be shared on an international level, these two can continue to share their experiences between visits and communicate quickly across political, geographical, and even cultural barriers to keep connected. Millennials are able to push boundaries in ways our predecessors could only dream, chanting a motif of “peace, love, unity, and respect” all the while. It’s this desire to keep each other close, despite the distance, that keeps us in Facebook forums talking about ticket sales and our next show and that keeps couples like Estefania & Phillip on different apps to share a photo, a text, a video, a moment. TomorrowWorld is more than just a weekend in September. It’s symbolic of a movement, of a shift in how people experience sounds, how they communicate, how they share experiences, how they keep close– even when they’ve only known each other for only a weekend, or a day, or have never met at all. There are people who feel like intimate friends because they have a shared interest, met on a Facebook forum, and now are “friends” and chat constantly– and they hope to meet at a show or festival, just to share a simple bracelet that says, “I acknowledge that you are an important being sharing in this experience with me.” And at the end of it all, it’s that desperate hope to find someone who shares in the same passion for life that you have, who feels every beat the DJ plays in every fiber of the being just like you do, and who can share in the same experiences you care about. And that, my friends, is timeless. Tickets for TomorrowWorld will be available February 22! You MUST pre-register here to get tickets!